Piers have always drawn people to the mysterious wonder of the ocean. The ability to seemingly walk on water with the construction of a pier has created for humans a sense of temporary mastery of the majestic and merciless sea. The Southern California shoreline has always attracted tourists from near and far to experience the natural beauty of the coastline. Capitalizing on the natural and man-made appeal of the ocean and the pleasure pier, Henry Huntington created in Redondo Beach a fantasyland of wonder and excitement for beachgoers in the early 20th century. 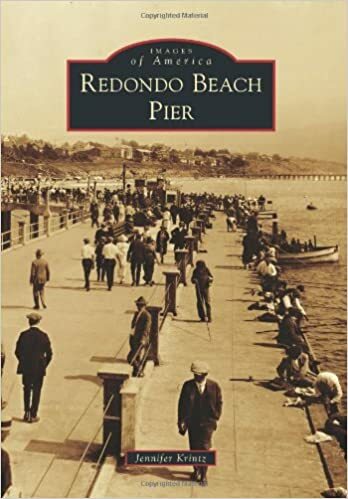 As one of the major rivals to the pleasure piers of Santa Monica, Ocean Park, and Venice to the north, the Endless Pier and later the adjacent Monstad Pier in Redondo Beach drew in thousands of tourists a day. Pleasure-seekers can still fish, enjoy dinner and music, shop, or simply take a nighttime stroll over the water on today's Municipal Pier--remnants from the heyday of Redondo Beach's pleasure pier of the early 20th century. 1900. The large building on the beachfront is a casino that was later replaced by the El Paseo entertainment area and other amusements that adorned the shoreline in the early 1900s. Fishing was and still is a favorite pastime on the pier at Redondo Beach. Even before the construction of Endless Pier in 1915, fishermen lined the deck of the wharves daily. Here is a picture from around 1900 of a man in Redondo with his catch for the day. After the demolition of these wharves, a man named Capt. incorporated in 1901, and tracks were immediately laid through Los Angeles, Orange, San Bernardino, and Riverside Counties. In this photograph, a train hauls lumber from one of the wharves through El Paseo, and it appears that the casino building is on fire. Scaffolding on the Redondo Pavilion can be seen in the background to the right. This image looks as if it was taken from the northeast while facing south down El Paseo some time after 1908. This is another view of El Paseo from around 1910.